Why is crushing ice so difficult? 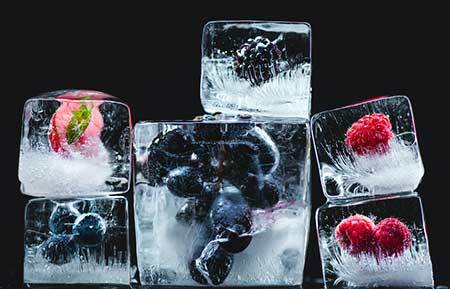 Or frozen fruit for that matter, surely it shouldn’t be as difficult as it is to make a frozen drink? That is, if you don’t have the right tools. Fortunately, I’ve covered everything you need to know about a blender that will crush ice, frozen fruit and you’ll be sipping on delicious frozen drinks in no time. But the best part? They’re all available on Amazon! So you can just click through and order yours today. Check out the table below for the quick overview. Does It Have The Right Blade? Cheaper blenders can sometimes have a really sharp blade inside of them so when you use it it seems to be as good as a more expensive alternative, but the problem is it blunts, and once it blunts there is no way to sharpen it. So you’ll have an excellent blender for 3-6 months and then you’re left with a mediocre blender, especially so if you’re blending ice which is very hard. Now what better blenders have is duller blades made of stainless steel and a more powerful motor, so it doesn’t need the sharpness because of the raw power that can crush ice and blend up pretty much anything. And because the blades don’t get blunt it stays as good as when you got it for years to come. So power is important… But how much power do we need? Well it varies from model to model because more power that isn’t used right still won’t be able to blend ice properly. So as a general rule you want more than 1200 but if it’s a cheap blender that won’t guarantee it can blend up ice or frozen fruit. You can buy an electric ice shaver like this one that only makes crushed ice if you want but (and as much as I like snow cones) I personally like a bit of multi-function in my appliances. So a blender that not only crushes ice but can make a delicious frozen smoothie, even pesto, dough, ice cream, soups and nut butters is much more up my street, and yours too if you’ve found your way to Juice Buff! Lastly, you want to make sure you have a big enough container, no point only making a tiny amount of crushed ice, you want to make it all in one batch and have plenty to use. Not a problem with the ones I recommend here, the only real problem would be if you got a personal blender (think NutriBullet) but they aren’t powerful enough to handle ice very well so it shouldn’t be an issue. Crazy levels of power and aircraft grade steel blades, what more do you need for crushing ice? While the Vitamix series can seem expensive it’s because they’re the best, incredible power in the motor with 2.2hp (about 1650 watts) which is engineered into the system giving you the absolute maximum blending power possible. Ice gets turned to powder into no time at all and inside a drink, frozen fruit gets obliterated. Meanwhile the cool-running motor makes sure that the whole blender doesn’t get hot and start melting the ice you’ve just made. There is also a huge amount of versatility in this blender letting you not only blend ice but also frozen fruit smoothies, even soups and doughs, real bang for your buck. One small problem is the shape of the jar… It’s got some funny little dents and creases in it that make scraping anything out that doesn’t just pour out a bit of a pain. You need some skills with a spatula to get nut butter out the bottom for instance but you learn the trick to it quickly enough. The last cool thing I want to mention is that it’s self-cleaning! You just drop in some dish soap and water and turn it on and it’ll whizz itself clean and you just have to pour out the dirty water from inside, once more with some water to rinse and hey presto! Far easier than taking it all apart and scrubbing in and around the blades. A quick note to say I went for the 5200 and not a newer model because it’s a bit more affordable and equally as powerful and capable at blending ice as a newer version. 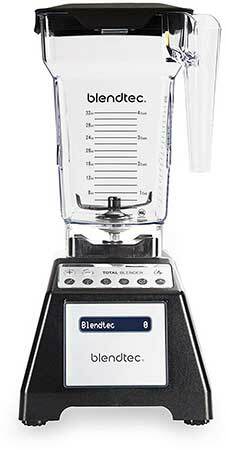 Overall easily the best blender you can get for ice. What’s an auto IQ timing I hear you ask? Well, it’s basically preprogrammed settings that then set a timer so you don’t over blend what you’re making, for instance, you hit smoothie or frozen drink and it will time it so that it comes out smooth but doesn’t over do it to the point where what you’re blending gets hot. Now what about the ice… The ninja definitely has the capability to blend ice being powerful enough to blend it down into snow with relative ease, you can make margaritas in no time and it won’t break the bank doing so. I’m not sure what the blade material is so don’t know how it will last in the longer term which is why it’s not above the Vitamix. 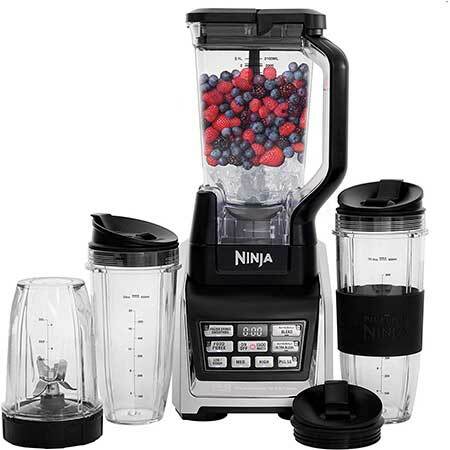 Where it does come out on top is with the price point, it’s much lower than other top range blenders while still being able to hold it’s own against them, it’s not as good but is still a really good blender. It also comes with a personal blender attachment so you can use it to make easy on the go smoothies, it won’t be much use for ice but it is a nice extra to improve its usability I thought. A final not just to say this is loud, all blenders are of course but this one seems to be just that little bit more so. As the youtube videos showed the Blendtec blender can blend pretty much anything and everything, so it can indeed handle blending up ice! Once again the blades are made of durable steel and designed to be blunt, this has a huge advantage that it means they won’t go blunt later and stop working. They claim a blade that is 80% thicker and 10x stronger than other blender blades, they don’t say what blender blades so you have to assume cheap ones, but still, that’s pretty impressive! The jar is a really nice four-sided shape so it’s nice and easy to get whatever you’ve made out again, there are no cracks for what you’re cooking to hide in and get stuck you can just scrape out with a spatula easy peasy. It doesn’t come with anything to push down what you’re making but that’s by design because it should just cycle through itself so you don’t have to push anything down, but a lot of people resort need something now and again just to give it that little push. You can use a wooden spoon or the like easily enough but it seems like something they could have added without much trouble. Will this turn ice into snow day in, day out? But it is under $100, can whip up a pretty good frozen smoothie, handle frozen fruit well enough and crush some ice into ice chips. And for some people that’s all you’ll need so I wanted to include it. You can use the 7 speed settings to get the right consistency of smoothie and it should handle any frozen fruit you throw in there. 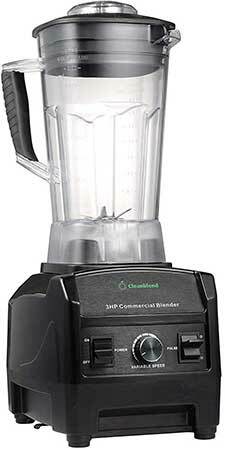 Another cool addition for the price point is the chop and smoothie setting both work on a forwards and backwards motion which provides a more thorough mixing of everything and stop it from getting jammed. Overall, a pretty good blender for the price, if you need something more heavy duty then you’re going to need to spend more money. This thing really packs a punch in terms of power boasting 3hp and 1800 watts, that makes it commercial grade and absolutely capable of blending ice. The 64 oz container is also plenty big enough to blend up lots of ice at once and it will turn just about anything into a smoothie, so frozen fruit can be handled with ease plus you get all the little extras that you want from a blender this powerful, you’re able to make nut butters, soups, ice creams, all the good stuff. The container is a pretty reasonable shape so isn’t too much hassle to clean up which is always a welcome plus. If you need crushed ice for your business then this will serve you well, just be aware that it is very loud so not ideal for having on a bar or just behind a counter at a cafe. This also comes with a tamper and a whole to use it on top so you can just squidge down anything you need to and get the full processing power you need. A nice commercial blender more than capable of handling ice plus anything else you can throw at it. 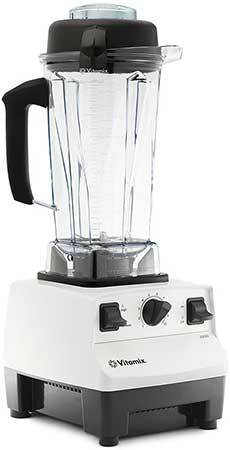 A few cool things about this blender, the first is the quiet shield. It’s the big upturned just that sits on top of the blender that works to keep noise to a minimum, which is especially handy if you’re blending ice which can be very noisy. And the quiet shield works as a big serving pitcher too, I really like that double functionality. The second is that it also features a clean setting so you again can clean the inside the blender by just adding water and a little dish soap. If you want a deeper clean you can put both the main jug and the shield in a dishwasher. It’s cheaper so even with the 2hp motor it doesn’t have the blending power of the Vitamix but it can handle turning ice into crushed ice, it’ll turn it into snow eventually but not as fast as a Vitamix will. It includes a tamper which you can use to push down while you’re blending but just be aware it doesn’t fit through the outer jug as well, you have to take that off to be able to use the tamper. Which is good otherwise the outer quiet shield jug wouldn’t be much use as a pitcher! Overall a great quiet blender for ice. Nice to see your post, most obviously ice is the toughest thing to blend so everyone needs to a special blender to make smoothies and frozen drinks. But i think 1000w motor power able to crush ice easily.